But let’s get our heads out of the cloud and chat for a moment about why removable drives are better for backup than the cloud. When removed, they are nearly bombproof. Removable drives can’t be manipulated, deleted or hacked if they are off and/or unattached to a computer. They do not require an internet connection to be used. Data can be accessed anytime, anywhere. Speaking of internet connectivity. 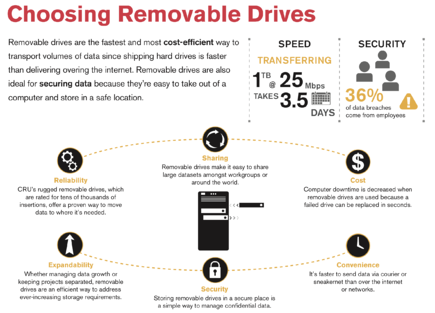 Removable drives don’t rely on bandwidth. So there’s no need to worry about cost, speed or reliability for that. They’re faster at recovery and backup than cloud services. There are no hidden fees. Once you have them, you own them and the storage they provide. There is no limit to their storage capacity. You decide the number and size of removable drives you purchase, and you can demand can drive any upgrades. You can see, touch and transport them off-site for any reason. Depending on where you move them, you need not incur storage fees. The buck stops with you. Each removable drive can be catalogued, accounted for and easily retrieved. This entry was posted in Desktop Storage, Data Backup, Removeable Drive, Data Security by CRU. Bookmark the permalink.